At first glance this $399 Domia X10 touchscreen control is fantastic. 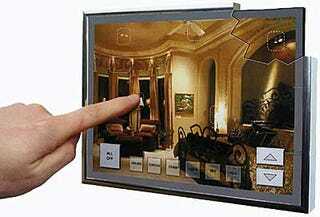 You get a real-picture representation of your room so you can easily select which lights you want to turn on and off. However, the Domia is actually just a fancy picture frame that you stick an actual picture of your room into before configuring the unit with buttons to turn each item on and off. Considering the price, we're not sure that it's worth it just to have a cheap-looking picture of your room around to remember which switch turns off what. Unless you're setting this up for grandma, in which case it may be worth it just to avoid the midnight tech support calls when she can't figure out how to turn everything off to go to bed.